Brooklyn Bridge Park is lit by metal halide lamps strapped to telephone poles*, creating what you might call a “parking lot aesthetic”. It’s true that the wood pole-with-cobra-head-lamp is a ubiquitous object along most city streets, often coupled with telephone cables and electric power lines. And it’s also true that most people consider a good park light to be the pedestrian-scale glowing object descended from the old gas lamps lining the promenades of European capitals. But this misses an important precedent: the old moon light towers of the 19th century. Between 10 and 20 stories high, these towers were meant to light great swaths of the city and seem to have been particularly useful in sprawling industrial towns with big working and recreational spaces that would have been too costly to light with pedestrian lamps. The moonlight towers, an arc light on top of a truss tower, were an American adaptation of a trend begun in Paris where efficient arc lamps began to be used at the top of buildings in place of oil and gas lamps. Though extremely efficient and relatively easy to operate, arc lights burgn bright and extremely hot and so were not suitable for indoor use. However, when placed on top of a giant tower they had the ability to light entire city blocks using far less labor and energy than gas lamps. 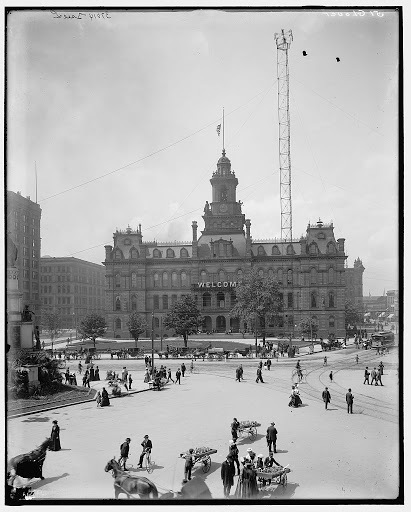 In 1885, this New York Times report of the Convention of the National Electric Light Association reported that Detroit was using 90 of these towers in a triangulated pattern to light an area 10 1/2 square miles at a price that was slightly cheaper than naphta or gas lights. The result was such that “the entire city was lighted as if by an artificial moon and the rear yards and alleys were made as light as the street.” Judging by the trusses and cables in the below picture the effect was likely that of an elegant scaffold erected over the city. Of course, that report, being from the Electric lighting commission, was biased. It did light up streets and alleys and yards, but only those blocked by buildings and trees. Despite the tower’s ability to light up entire city blocks with the power of a moon, they fell out of favor because they created large shadows. The ever higher buildings of the 19thand early 20th century often resulted in one half of the street being well-lit while the other half was in total darkness. The large territories of shadow-and-light created zones beyond the control of the city manager; creeping grins leered at the upstanding citizens on evening strolls from across the road, and hideous creole cackles rang through the darkened half-streets of industrial towns up and down the Mississippi Valley. The lights were phased out and the streets more evenly lit by pedestrian poles topped with new electrical incandescent lamps. Nonetheless, it is encouraging that these effects are being brought back into public spaces. Not every place needs to be domesticated by a pedestrian scale lamp, bathed in light and scaled to the human body. While landscape architects have traditionally been consumed with the creation of the perception of safety and control, we like to think there is room for the lunatics who roam the shadows, ebbing and flowing with the light of the moon [1, 2]. Because landscape practice not only establishes a territory and formalizes methods of control, it also generates the conditions for deterritorialization, speculating on ways that those boundaries might be transgressed and how one might embrace the bigness and wildness of it all. 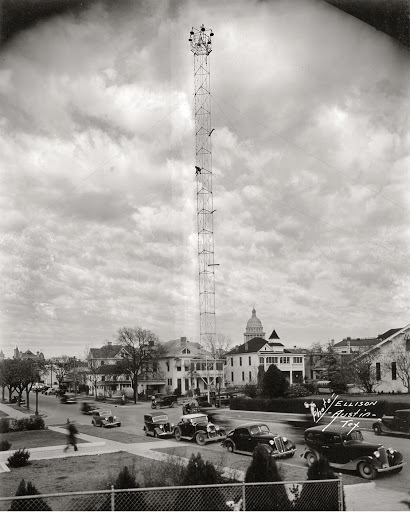 [New Orleans used a moonlight tower in the 1880s and 90s along the levee at Canal Street. 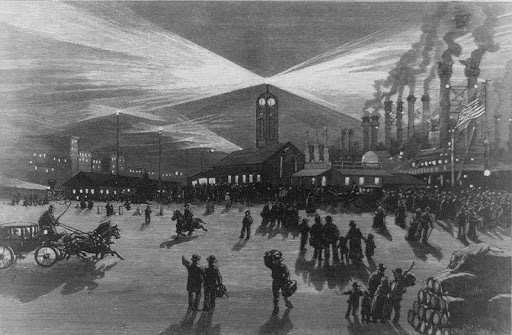 The all night light and shadow enabled industry, commerce, and recreation to continue throughout the night in the French Quarter. 1- the term “lunatic” can be traced back to the latin “luna” for moon, from the belief that periods of insanity were related to the cycles of the moon. 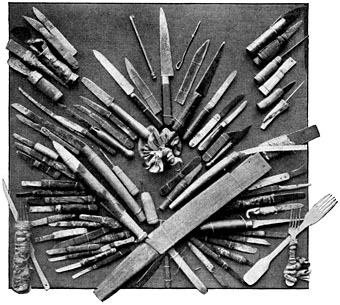 2- we don’t mean to imply too strongly that MVVA is very concerned with the lunatics and operations of deterritorialization. In fact, they are one of the best at gentrifying derelict urban zones through landscape design, working almost exclusively for the bourgeioise. 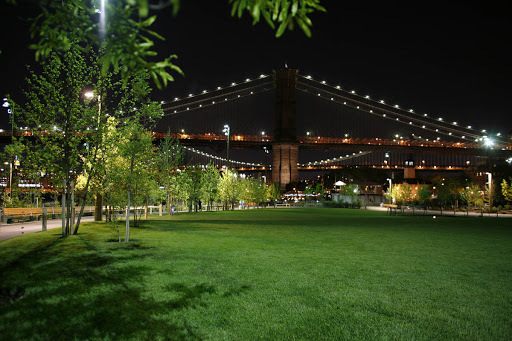 But they also do some interesting work that transgresses their own control mechanisms, and the lighting in Brooklyn Bridge Park may prove to be an example of this. Regardless, it is far superior and more apt to use tall lights at the waters edge in NYC than it is to put those ridiculous pedestrian poles that line the riverfront promenades on the west side. "Not every place needs to be domesticated… and scaled to the human body. "Though you've phrased it specifically (and well) in relationship to lighting, this works as a broader observation, too, I think. The phrase "we like to think there is room for the lunatics who roam the shadows, ebbing and flowing with the light of the moon" makes me instantly think of the security of "public" space. Something like CPTED for instance which is embraced by many public agencies would I believe expressly argue against your proposal. While i think that the need for a trangressive landcscape is a needed and useful project i wonder how one could reconcile the lunatic design of public space with such concepts? Or would the very proposal be an argument against concepts like CPTED?As to the general idea of non human scaled spaces i heartily embrace it . Moreover the very concept of a moonlight tower is fascinating. Although, i must admit i thought that it referred to some sort of reflecting mechanism which employed only reflected moonlight for lighting..